As all sushi train devotees know, it’s very easy to eat more sushi than you budgeted for. But at Melba, you can pay $94 and get all the sushi your heart desires. Yes, it's on the pricey side – which is why you're just going to have to eat your body weight in sushi. 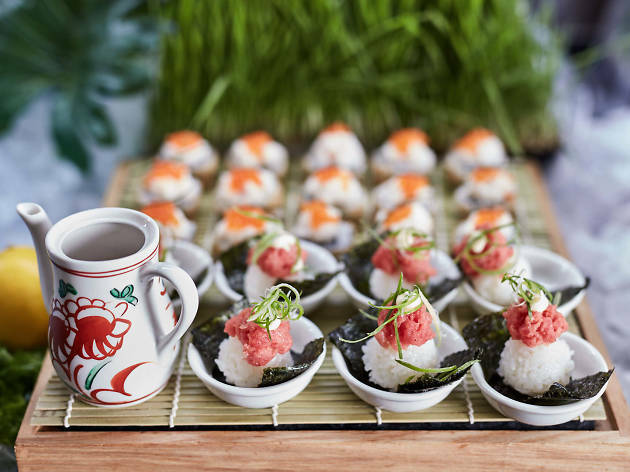 Every Thursday night in September the Langham is hosting a sushi and sake buffet where you can eat as many dainty little Japanese dishes as you desire. The buffet menu varies throughout the month and includes both traditional and contemporary takes on sushi. That means you can enjoy quality yellowfin tuna nigiri and salmon sashimi alongside bites like deep-fried eel and avocado rolls. There’s more than just sushi too, with Japanese favourites like chicken yakitori, katsu curry and soba noodles all on the menu. Then finish your meal with a selection of sweets with Japanese-inspired flavours. Sample matcha opera cakes, ginger crème brulees and yuzu and passionfruit tarts – along with a green tea-spiked dark chocolate fountain. For the complete experience, buy three 30ml cups of sake for an additional $9. The sushi and sake buffet somes to no surprise to Melburnians familiar with the Melba. The swish restaurant is well known for its regular buffets, and it often hosts themed buffets throughout the year (previous iterations have included Father’s Day, French fry and s’mores buffets). The Melba is currently taking bookings for its sushi and sake nights, happening every Thursday during September.